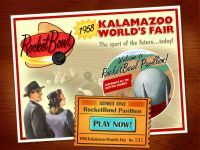 RocketBowl is a cross between bowling and miniature golf, in which the player must strike 10 pins with a bowling ball, but in a completely open area rather than an enclosed lane, with the other frames visible on the landscape; it is possible to knock down the pins of another frame while bowling. Each frame features a green pin (or pins) called the "money pin" that awards cash when knocked down. There are also coins scattered around the "frame" that also awards cash. After each successful set of frames, the player has the option to buy items, including 20 bowling balls each with special powers, such as rockets that allow the bowler to immediately blast the ball in a different direction. As the game progresses, each frame becomes more and more like specialized miniature golf holes, with alternate routes, obstacles, and so forth. Source: Wikipedia, "RocketBowl", available under the CC-BY-SA License.